Every action we take impacts the Earth. It is up to us to make that impact for the better. When you visit the zoo, you are already taking a conservation action. Your zoo admission or membership supports our conservation mission. Your time at the zoo is a chance to learn, care and join us in further action. Here are just some ways the Woodland Park Zoo community is getting involved and making a difference for wildlife. See animals, save wildlife. It’s that simple with Quarters for Conservation. Every time you visit the zoo, you have the chance to vote for the conservation project you want to support. Together, your votes can have a big impact. 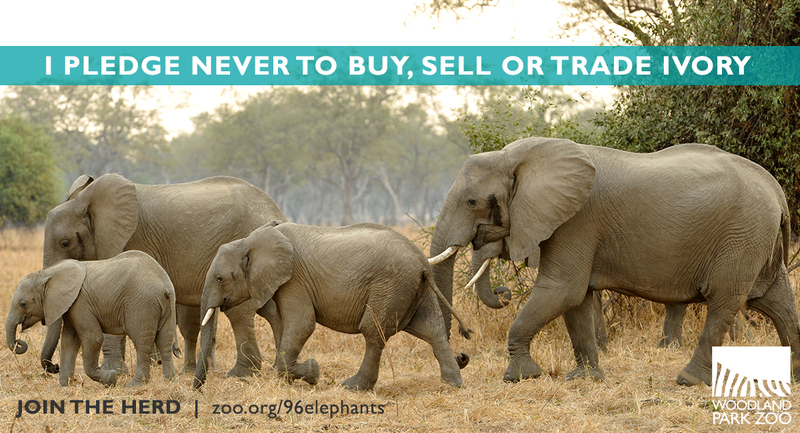 Did you know 96 elephants are killed every day in Africa? The U.S. is the second biggest market for ivory in the world. This is our problem and we are the solution. Woodland Park Zoo joins Wildlife Conservation Society and more than 100 zoos and aquariums in the 96 Elephants campaign to stop the killing, stop the demand, and stop the trade. Will you join the herd? Get tips on every day choices you can make to share the habitat sustainably with wildlife—and future generations. Discover how the cultivation and use of palm oil is impacting habitat for orangutans, elephants, tigers and thousands of other species, and learn how your choices make a difference. Travel with the zoo for rare opportunities to visit with our field conservation partners, see their programs in action, and view the wildlife they are working to protect. We are leading a trip to Borneo in fall 2016; and Yellowstone and Grand Teton National Parks in May 2016. Join us for an adventure of a lifetime.